The Dark Knight detective faces a new, deadly enemy in All Star Batman #10, an unpredictable foe, one whose attacks are seemingly impossible to counteract! Batman uncovers a dark scheme from decades past, but inconceivably the architect of this insidious plot could well be one of his closets allies of all! All Star Batman #10 reunites Scott Snyder with his American Vampire collaborator Rafael Albuquerque for this stunning new Batman story arc: The Last Ally! Interspaced with flashback to a rooftop chase across the pond in London and Batman and Alfred’s present day escapade in Miami, All Star Batman #10 hit’s the ground running, and doesn’t let up for a moment. The Batmobile is driven like an old pro, there’s an enemy with a familiar face to be caught, and the crowd goes wild before you‘ve even finished turning a few pages. Hell, you’d be forgiven for thinking that’d be enough full-on Bat-action for one issue alone, but this is Snyder and Albuquerque we are talking about here, and like Batman in this issue they sure know how to grab our attention with a scene stealing entrance! 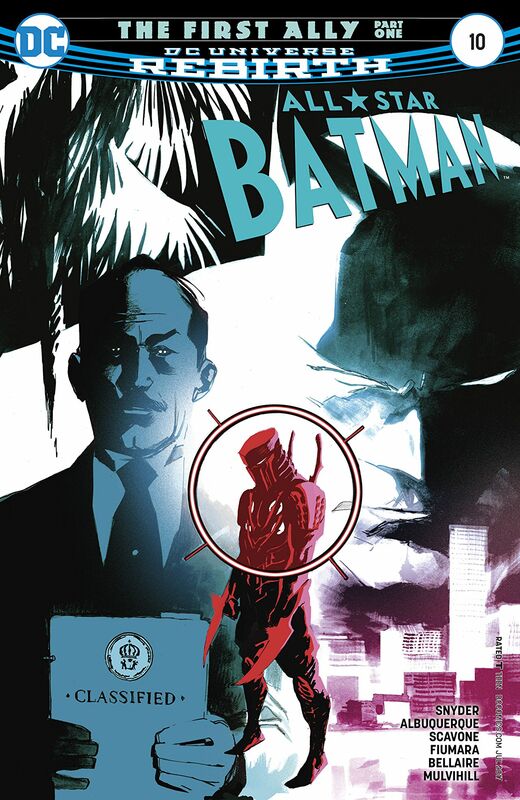 Having got word something dangerous is being smuggled into Miami, Bruce and Alfred go all good cop bad cop to get the information they need, and their subsequent attempt to infiltrate an old fort off the coast sequestered by a quartet of leaders from Miami’s most feared crime families puts Bruce in terrible danger. Initially what feels like an Oceans 13 heist coated with Miami Vice glamour and menace, soon becomes a deadly game of pirates, and before you can say shiver me timbers all hell breaks loose as the bullets start flying! This storyline is going to delve into Alfred’s past, an exciting concept in itself, but what I really liked about this issue was how Scott Snyder used the narrative to highlight the surrogate father / son bond between Alfred and Bruce. There are certain points in this issue, usually right in the thick of the action, where Alfred’s reminiscing feels genuinely heart-warming and quite moving. However, these moments are also powerfully counterbalanced with Alfred’s steely determination, especially during the interrogation scene, where we gain further insight into his character and just how far he’d be willing to cross the line if need be. The pencils and inks of Rafael Albuquerque’s artwork brings the first chapter of The First Ally to life in glorious fashion. The action is often fast and furious, with concisely structured page layouts relaying Snyder‘s vision with the same flawless synergy their collaborations always bring, as story and art seamlessly fuse as one. Rafael Albuquerque’s spectacular art effortlessly draws you in, you’d swear can almost hear the roar of the crowd as Batman ejects form the Batmobile, there’s centrally no doubting that Alfred means business either, those flashbacks have a unique favour that perfectly encapsulates the era, and the high-tech security of the fort soon becomes engulfed in a slow-motion barrage of gunfire with a yo, ho, ho, and a bottle of rum. The colors by Jordie Bellaire beautifully complement Albuquerque’s art, from the dusky hues of London from times before to the bombastic tones of the opening chase sequence, though to the vivid shades of the Miami skyline, and the ice blues and greys of the fort showdown, Bellaire’s colors sublimely enrich every single scene. Killers-In-Law, written by Rafael Albuquerque and Rafael Scavone, featuring art by Sebastian Fiumara, and colors by Trish Mulvihill, is the new backup story which accompanies this new All Star Batman story-arc, involving Bruce Wayne going deep undercover to infiltrate the Russian mafia. It’s an edgy, brutal, bare knuckle story, one that plays its cards close to its chest, insomuch that it fills in just enough back story to keep us guessing how everything is going to slot together with The First Ally story-arc. Scott Snyder and Rafael Albuquerque round off The First Ally: Part 1 in fine style. You might say that Bruce’s good taste in art is his saving grace in this issue, but it also puts him smack-bang in the middle of a heart-grabbing mystery, one that Snyder brilliantly blindsides us with as past and present collide in the most unexpected way possible. The First Ally is another masterpiece in the making from Snyder and Albuquerque, with its gritty storytelling and outstanding artwork, All Star Batman #10 doesn’t just exceed expectations, if anything, it drives right through them! Yeah, you’ve convinced me. I really need to catch up on this series especially now that I’ve dropped Ton King’s Batman run. So do various Batman titles run independently of each other? How do they keep consistency with character while all playing in the same universe? All of the Batman titles are more or less independent of each other, and share the same Continuity. As for keeping everything balanced and consistent, well they’ve done ok so far with DC Rebirth. Well, it depends, like when Jim Gordon took over when it was believe Batman had died fighting the Joker, and we had the robo Bat-suit / Gordon Batman arc in Superheavy, then it obviously carries over into the other related Bat title in the DCU. Otherwise, no, it doesn’t really. Batman is usually considered the flagship DC comics Bat-book. So how does this arc compare to the previous ones? Better? Worse? It sounds interesting and I love Rafael Albuquerque. Nice review Paul, this certainly sounds like a great read. I’m definitely going to be collecting the volumes of this series (think volume 1 is just fresh out, the only hesitation for me is John Romita Jr’s art really). I hear Scott Snyder has one more arc planned after this, I wonder if DC will finish the series then or continue on with a new writer?